Four species of aphids on citrus are recorded in Australia but only two occur in Western Australia, the brown/black citrus aphid Toxoptera citricidus (Kirkaldy) and spiraea aphid, Aphis spiraecola (Patch). 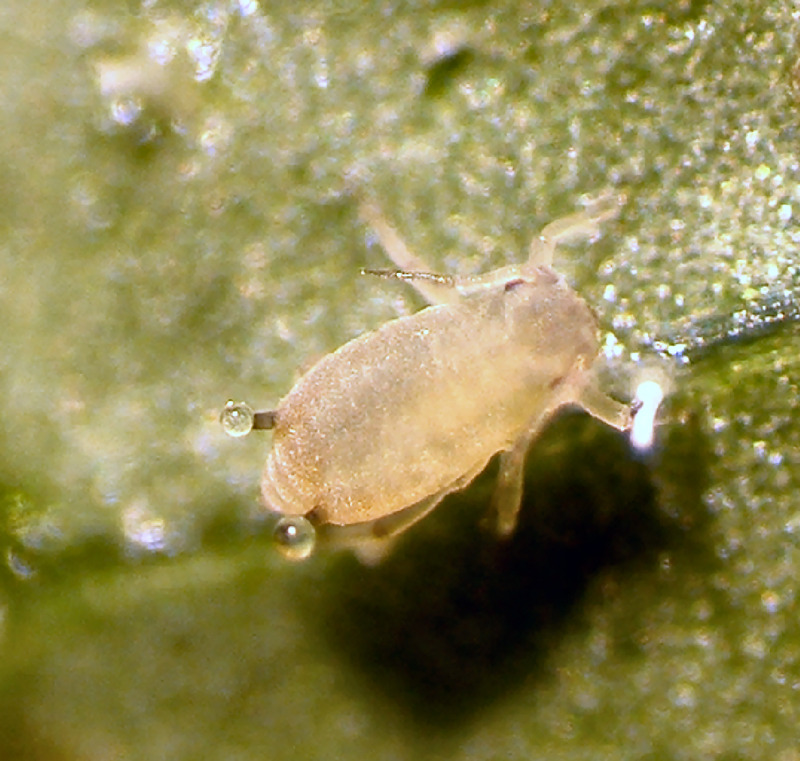 Like other sap-sucking insects such as mealybugs and scales, aphids produce a sticky substance (honeydew) as they feed on the plant. A black fungus (sooty mould) grows on the honeydew, coating leaves, branches and fruit with a black powder. Aphids can be a threat to young trees, but are otherwise regarded to be minor pests. All aphids have a piercing-sucking mouthpart (stylet) that they insert into the plant tissue to feed on leaves, green shoots and flowers. Leaves may curl as a result of feeding damage. Large quantities of honeydew are also produced as the aphid feeds. Leaves and fruit often turn black with the growth of the sooty mould fungus. 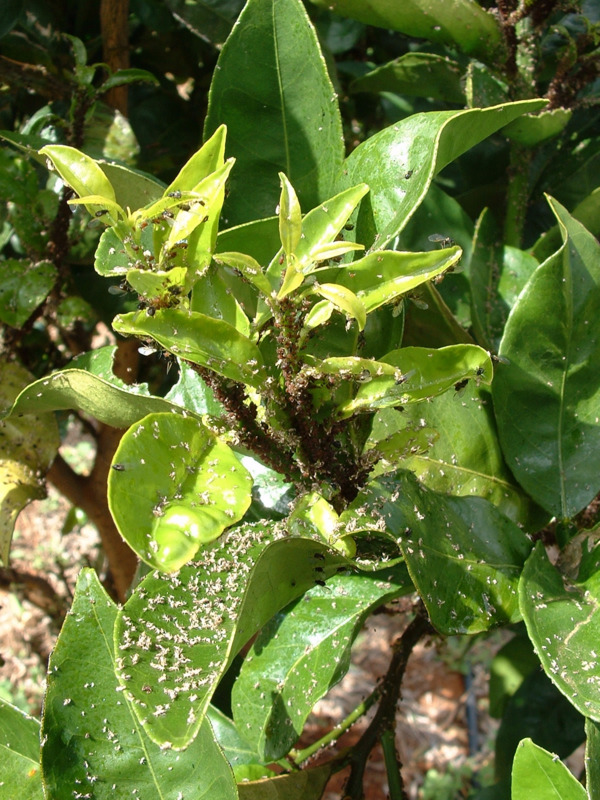 Aphids are not usually a problem in citrus, except on young trees. 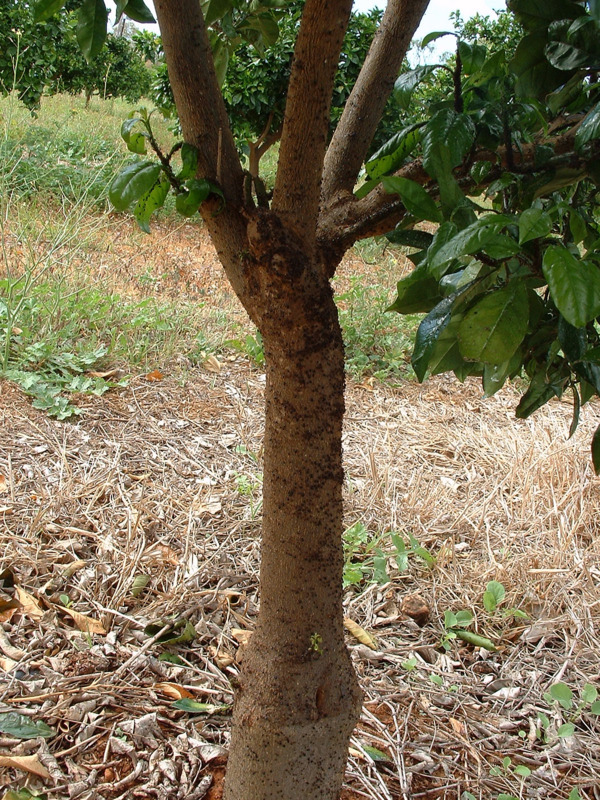 Overseas, black citrus aphid has been associated with the spread of citrus tristeza virus which causes dieback. Females do not need to mate to produce young and no eggs are laid. Live young are produced through a process termed parthenogenesis. Female aphids are born pregnant and adult females can be wingless or winged. The presence of winged forms (alates) indicate that the food quality has declined, or that there is overcrowding. 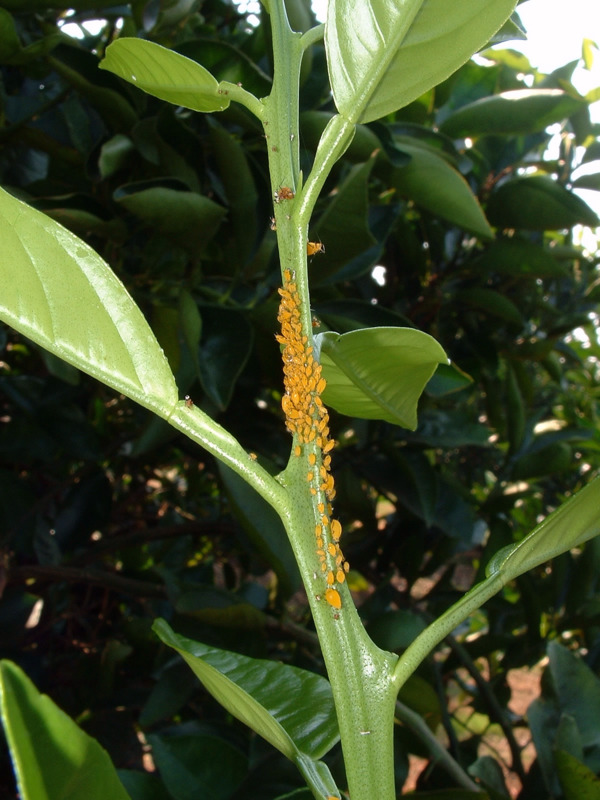 This aphid is found in all Western Australian citrus growing areas. Adult: shiny black, 2mm long, winged or wingless. An entire generation can develop in one week. Nymphs mature in 6-8 days at temperatures of 20ºC or above. 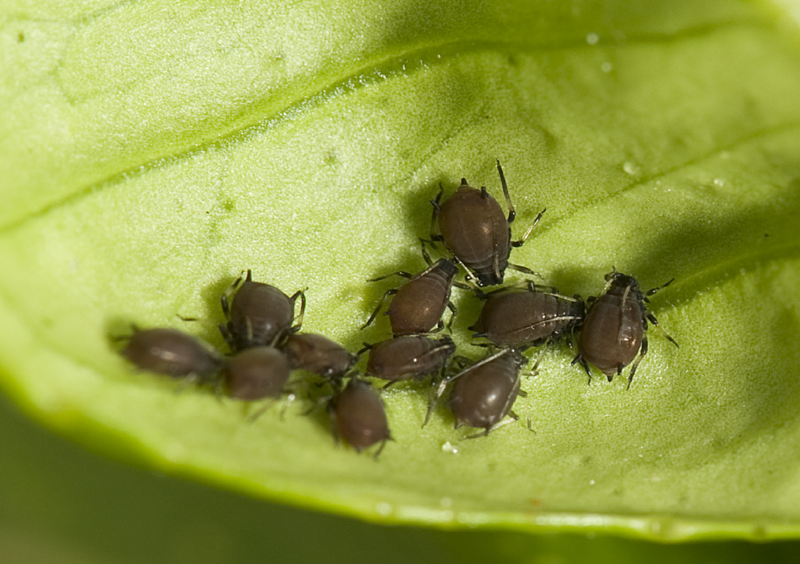 A single aphid can produce a population of over 4400 in three weeks in the absence of natural enemies. Young trees from February to March and then again September to December. 25% or more of leaf flushes infested with aphids. Regarded as rare in WA citrus. Adult: apple green, 2mm long, winged or wingless. An entire generation can develop in one week, with females each producing 60 young. Up to 25 generations per year. Young trees from February to March and September to December. 25% or more of leaf flushes. Natural enemies normally keep aphid populations under control, and chemical control is rarely required. Use a specific aphicide or horticultural spray oil if required. Commercial growers should consult their nearest agrichemical supplier or the APVMA for registered pesticides. Always check the label before spraying, as not all oils are registered for use in citrus. Oils can also cause phytotoxic damage if not used correctly, such as when plants are heat or water stressed. Predators, parasites, and fungal diseases all attack aphids and occur naturally in the orchard. The honeydew produced by the aphids provides a good food source for many natural enemies, as well as pests such as ants. Aphid parasites include the wasp genera Aphidius and Aphelinus: neither is available commercially. The female wasps lay their eggs individually inside the lower part of the abdomen of young nymphs. The parasitised nymphs appear bloated and bronze in colour. Aphids are attacked by many generalist predators include hoverfly larvae (syrphids), ladybird beetles and lacewing larvae.